Brian Pete is president and cofounder of Robin Fogarty & Associates, an international educational consulting firm. Pete has a rich background in professional learning and is entering his 15th year as an author and presenter, working exclusively with the adult learner. Pete visits schools throughout the United States, Europe, and Asia. He is the coauthor of Data! Dialogue! Decisions! Brian Pete and Robin Fogarty are the coauthors of Twelve Brain Principles That Make the Difference, Nine Best Practices That Make the Difference, The Adult Learner, A Look at Transfer, Close the Achievement Gap, From Staff Room to Classroom, Supporting Differentiated Instruction, How to Teach Thinking Skills Within the Common Core, School Leader’s Guide to the Common Core, and more. Their book The Right to Be Literate was named the 2017 Teachers' Choice Award Winner for Professional Development. 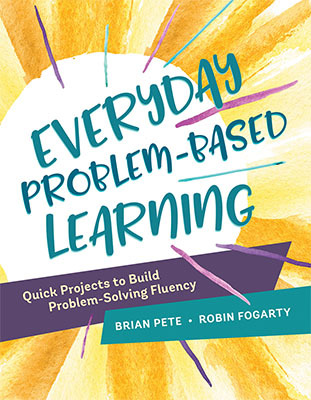 Brian Pete and Robin Fogarty present ways to use problem-based learning as a daily approach to helping students learn authentic and relevant skills.